In early October, I visited Boston for a few days to explore a city I have long admired but have only been to once before. This former Midwest and D.C. gal was all about diving headfirst into the history and arts and culture of one of our nation’s first cities, and I made the most of it. Established in 1630, Boston is probably most well known for its role in the American Revolution, its 2.5-mile Freedom Trail hosting 16 historic sites such as the Old North Church, the Paul Revere House, and the site of the Boston Massacre. Also included on the Trail is the Old Corner Bookstore, once an apothecary and home to the Puritan dissident Anne Hutchinson, and also the oldest commercial building in Boston, according to the Freedom Trail Foundation. The Bookstore is on the corner of Washington and School Streets, and is now a Chipotle, but it is also the first stop on the Literary Landmarks Tour, one of many historic tours presented by Boston By Foot. 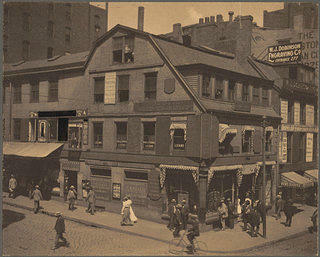 In the 1820s, the building was transformed into a bookstore and publishing house, establishing Boston as the birthplace of American literature. Publishers William Ticknor and James Fields brought us works from the likes of Emerson, Alcott, Hawthorne, and Longfellow well into the 1850s. By 1960, however, developers wanted to demolish the now-defunct bookstore to build a parking garage. Preservation organization Historic Boston saved the building at a cost of $100,000, and while it has been inhabited by a slew of retailers in recent decades, it is listed on the National Register of Historic Places and is one of the most popular landmarks in Boston. 1898 photo of the Old Corner Bookstore. 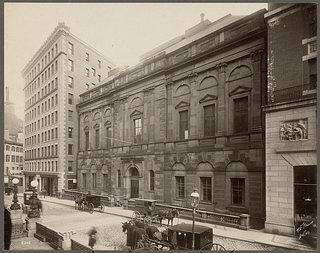 1900 photo of the Boston Athenaeum. Just a block away is the historic Omni Parker House, a grand hotel that celebrated its 150th anniversary this year. My tour guide shared how it played host to the famous “Saturday Club,” a salon-style gathering of notable writers and intellects in the mid-1800s, where again you might see Emerson, Hawthorne, or Thoreau discussing their works, exchanging ideas, and expounding on politics. Yet another couple blocks away is the Athenaeum, an independent library and cultural institution that was the heart of scholarly learning in the U.S. for decades. Today, this members-only library houses half a million volumes, including one of the largest collections of publications from the Confederate States of America during the Civil War. It also continues to host a variety of literary and cultural events and exhibitions for members and the public. 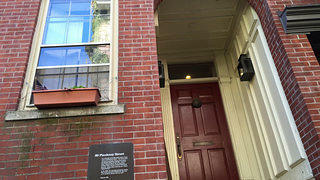 Front door to the Louisa May Alcott Home. Alcott’s father, Bronson, created the short-lived Temple School, which focused on critical thinking and conversation-based learning. Writer and poet Thomas Bailey Aldrich served as editor of Atlantic Monthly, and his move prompted the shift in literary culture from Boston to New York City. Henry James worked through a stage version of his "Daisy Miller" with arts patron Isabella Stewart Gardner, who established her now historic museum in 1903. Fireside Poet Henry Wadsworth Longfellow established one of the first literary clubs focusing on translating Dante in America. My literary needs weren’t completely fulfilled by the tour, however. 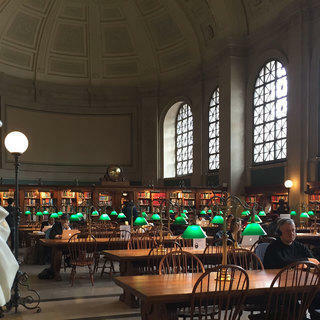 I also made a stop in Copley Square at the National Register-listed Central Library—the first large, free municipal library in the United States—to check out a couple of exhibits in the Norman B. Leventhal Map Center. I enjoyed a fascinating look at how maps played an important role in the American Revolution and the shaping of our country as we know it today. It turns out that literature on geography was in high demand in the early 1800s—who knew it could be so interesting? But what really intrigued me was the other exhibit, Literary Landscapes, which featured a beautiful collection of illustrated, pop-up, and digital maps of fictional lands. From well-known and beloved classics like “The Wizard of Oz” and “The Lion, the Witch, and the Wardrobe,” to newer stories like “The Hunger Games” and “Game of Thrones,” the colorful, detailed maps of all sizes bring to life the imaginary places we travel to through the written word. 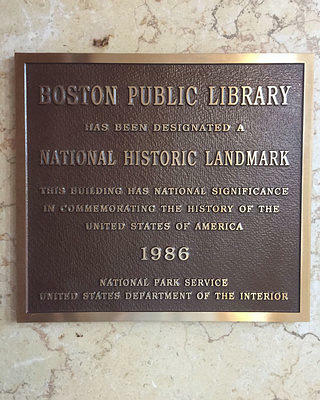 Historic Landmark plaque for the Boston Public Library. 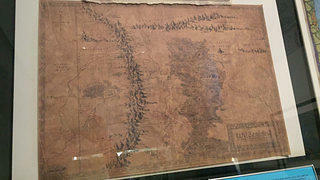 Map of Middle-Earth, on display at the Boston Public LIbrary. 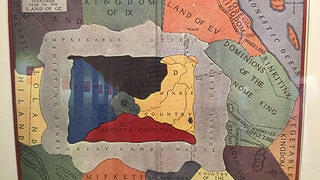 Map of Oz, on display at the Boston Public LIbrary. Storybooks for "Wizard of Oz" and "Alice in Wonderland," on display at the Boston Public Library. The juxtaposition of the buildings that housed and hosted the founders of American literature against the imagined and faraway lands of our favorite fictional characters was surreal. While we’ve long known that Boston is a mecca of history and preservation for our country, we must also acknowledge it for its place in cultivating the great culture and canon that put us on the literary map.